US adults will send more time on their mobile devices than they do watching TV by 2019, according to eMarketer predictions. The research firm estimates that in 2018 US adults will spend nearly 3 hours, 50 minutes per day watching TV, compared to 3 hours 35 on their mobile devices. 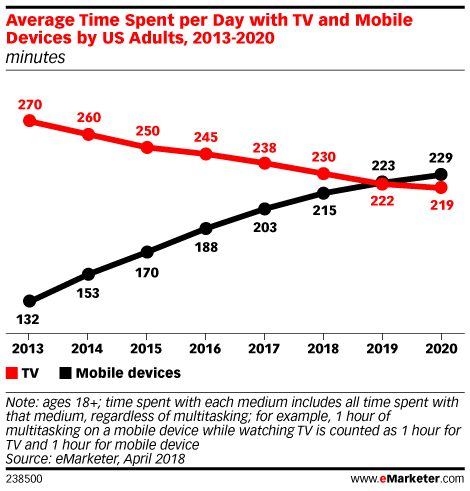 With TV time shrinking and mobile time increasing, eMarketer predicts that in 2019 people will spend 3 hours and 43 minutes on their mobiles and 3 hours 42 in front of their TVs. The gap is expected to widen to 10 minutes in mobile devices’ favour in 2020, with US adults expected to spend 3 hours 49 minutes on their mobiles by this time. However, eMarketer did add that time spent on mobile is “likely approaching a peak” and will start to plateau in a few years.